Salt Lake City announced its 100 percent goal last July when the Mayor and City Council passed a joint resolution establishing the goals of transitioning the community’s electricity supply to 100 percent clean energy by 2032, followed by an overall reduction of community greenhouse gas emissions 80 percent by 2040. On April 11, 2017, Salt Lake City released its Climate Positive Plan, which outlines the programs that will help transform and orient the local economy towards meeting those clean energy goals. Mayor Biskupski has joined the Sierra Club’s Mayors for 100% Clean Energy campaign to highlight the importance of climate action and to showcase the unique ways Salt Lake City is collaborating on this vision, particularly with local utility Rocky Mountain Power. In August 2016, the City signed a Cooperation Statement with Rocky Mountain Power, establishing a framework for creating pathways toward the 100 percent renewable electricity goal. This includes development and procurement of large-scale renewable energy projects; energy efficiency programs; the build-out of electric vehicle infrastructure; and progress on smart grids. Salt Lake City is also working on other fronts to achieve its clean energy goals, including an inter-local feasibility study with Park City and Summit County. The study will independently evaluate opportunities for meeting the 100 percent clean electricity goal community wide. Transportation, energy efficiency, food programs, recycling efforts and other programs to reduce greenhouse gas emissions are also discussed in Climate Positive. 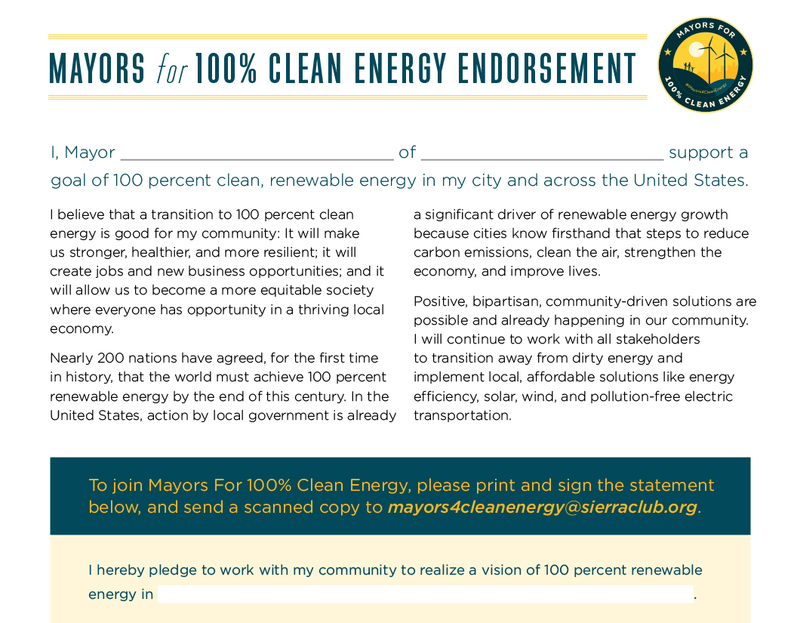 Ahead of the U.S. Conference of Mayors annual meeting in Miami Beach in June, today’s launch of Mayors for 100% Clean Energy aims to demonstrate bold local leadership and showcase the depth and breadth of support from city leaders for a complete transition to renewable energy. “Mayors can lead our nation toward a healthier, stronger and more prosperous country by championing a vision of 100 percent clean, renewable energy in their communities. Cities don’t need to wait for Washington, D.C. to act in order to move the ball forward on clean energy,” said Sierra Club Executive Director Michael Brune.